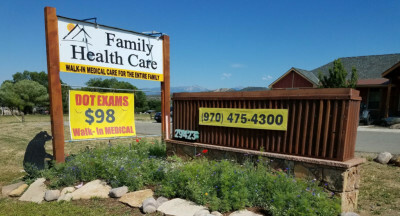 Family Health Care is a full-service, walk-in medical clinic serving Durango, Colorado and surrounding areas. We see patients of all ages, newborn to the elderly. Since we know how busy life can be, appointments are never necessary to be seen. We do offer appointments for problems that may take more time, such as a detailed DOT physical, wellness exams or a minor surgical procedure. We pride ourselves on providing the best health and medical care possible to you and your family! Care at it's best – blending quality, courtesy, convenience & cost effectiveness. Whether it's a mild illness, bumps & bruises, or routine wellness exams, we offer prompt, professional and personalized healthcare services you can trust. We offer traditional medication, herbal treatment and homeopathic remedies. We provide a variety of minor surgical services, right here in our office. Common procedures include mole & wart removal, ingrown toenails, skin tags, newborn circumcision and laceration repair. Platelet Rich Plasma (PRP) is blood plasma that has been enriched with platelets and can be used to stimulate healing of soft tissue via injections.